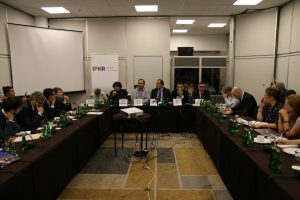 A briefing organized by Amnesty International, International Partnership for Human Rights (IPHR), the Institute for Reporter’s Freedom (IRFS) and International Media Support (IMS) at the OSCE Human Dimension Implementation Meeting in Warsaw on 22 September 2016 focused on the issue of ever shrinking civic space in Azerbaijan. The event was moderated by IPHR’s Project Coordinator Simon Papuashvili, who said that he was extremely pleased to be able to present a distinguished panel of speakers including several Azerbaijani human rights defenders who in the last two years were not been able to attend the HDIM because they were either in prison or in hiding. 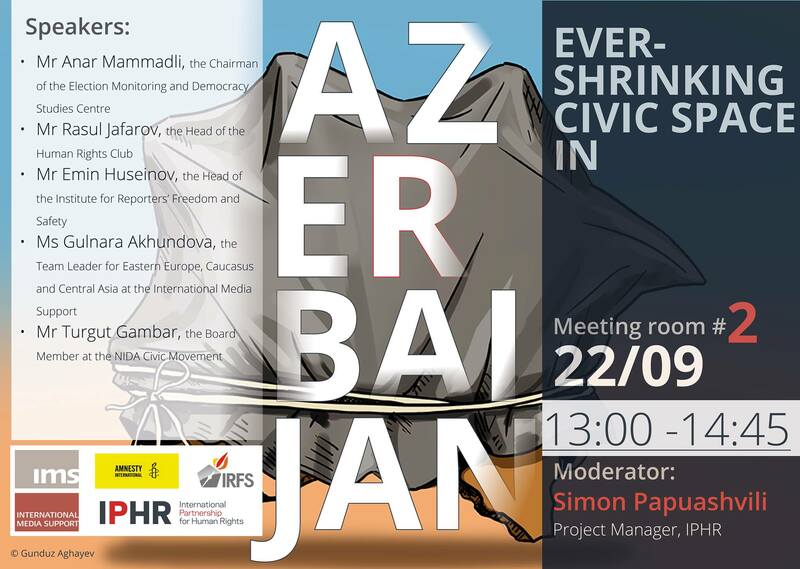 The first speaker, IRFS Head Emin Huseinov talked about the controversial constitutional referendum set to take place in Azerbaijan on 26 September 2016. He expressed fears that this referendum, which is expected to result in the approval of constitutional amendments that will further strengthen the powers of the president, will be followed by an even more fierce civil society crackdown than the one seen to date. Chair of the Election Monitoring and Democracy Studies Centre Anar Mammadli described developments taking place in the period of alarmingly shrinking civil society space since the 2013 presidential elections. He said that civil society has been subjected to three types of restrictions: legal restrictions on the registration and operation of NGOs; political repression; and financial restrictions. 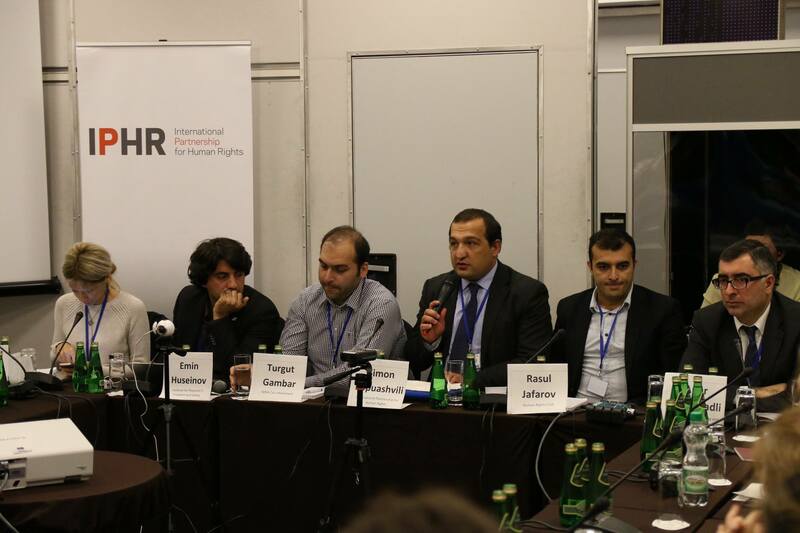 Head of the Human Rights Club Rasul Jafarov spoke about the efforts of him and his colleagues to compile an updated list of political prisoners in Azerbaijan. He said that there were some hopes that the earlier releases of him and other imprisoned activists indicated that the government is willing to put an end to political imprisonments. However, recently there have been new politically motivated criminal cases and arrests, which shows that this pattern continues. Turgut Gambar, Board Member of the NIDA Civic Movement drew attention to the fact that youth activists in Azerbaijan are particularly vulnerable to persecution, including arrest, prosecution and imprisonment on trumped-up charges. In connection with the recent developments in neighbouring Turkey, youth activists have been accused of having ties to the Gülen movement. IMS Team Leader Gulnara Akhundova presented joint recommendations to Azerbaijan’s international partners for how to can step up pressure on the government of the country to comply with its human rights obligations. She stressed, among others, the importance of making use of existing multilateral mechanisms, which in the OSCE context should include the so-called Moscow mechanism. The event was well attended and the presentations by the speakers were followed by a set of questions and comments from the audience. 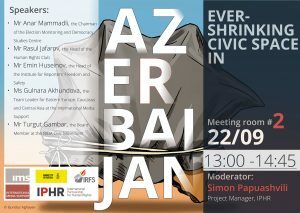 Unfortunately no official representative of the Azerbaijani government took part in the discussion.